This was cute: A Japanese television show this week staged a stunt in which Dodgers pitcher Kenta Maeda dressed up as an old man and pitched to a youth baseball team. This video is worth your time if only to see Maeda in costume. He pulls it off pretty well. The website SportTechie.com today released its list of the 25 most tech-savvy sports franchises in the world. The Dodgers rank eighth, behind only the Atlanta Braves among MLB teams. 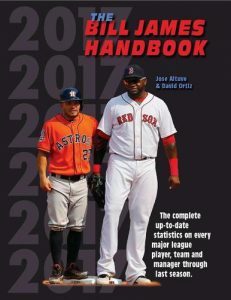 The 2017 Bill James Handbook is on shelves now. It’s 609 pages of facts, figures and other quantitative observations from the most recent baseball season. I’m always amazed at how quickly anyone can publish such massive amounts of data, let alone sort them and analyze them into something digestable. This happened before Game 4, which the Dodgers lost. Bad luck charm? World Series dates, times: MLB announces full schedule. The Dodgers are two wins away from reaching the World Series. The Chicago Cubs are one win away, but we won’t let that little detail get in the way of relaying today’s official announcement from Major League Baseball regarding the World Series schedule.